It was what was left behind that wrung the heart as you walked through Copley Square in Boston while the sun fell at the end of a very bad day. Tables full of unopened bottled water. Piles of those strange silver thermal blankets that have become as much a part of the annual event as spaghetti suppers and lost Scandinavians trying to find their way to Fenways Park. Bags of street clothes, waiting in great lines along Berkeley Street for owners who were god knows where. The Common. The Public Garden. Locked down in a restaurant into which they might have wandered to use the facilities. One solitary fireman, slumped on the bumper of a truck, eyes to the sky, without the energy to reach down and pick up a bottle of water at his feet, and then the shadows lengthening down Boylston Street again, and sirens and sirens, and then silence, and sirens some more. This is the tableau that’s left when you take out the joy. Nobody loves the Boston Marathon as much as the people who make fun of it year after year. This was the race that previously offered as a prize a not particularly expensive medal, a laurel wreath, and a bowl of beef stew. This was the race that, on one memorable occasion, nobody knew who actually won. I don’t know anyone who loved the race that didn’t mock it for its monumental inconvenience, its occasionally towering self-regard, and the annual attempts by Boston-area television stations to use it to win another shelf full of local Emmys. This includes me, and I’ve been around 25 or 30 of them, more or less, in one way or another, watching from the press truck, from the firehouse in Newton, from somebody’s roof, and very often from just barely inside the front door of the late, lamented Eliot Lounge. The Marathon was the old, drunk uncle of Boston sports, the last of the true festival events. Every other one of our major sporting rodeos is locked down, and tightened up, and Fail-Safed until the Super Bowl now is little more than NORAD with bad rock music and offensive tackles. You can’t do that to the Marathon. There was no way to do it. There was no way to lock down, or tighten up, or Fail-Safe into Security Theater a race that covers 26.2 miles, a race that travels from town to town, a race that travels past people’s houses. 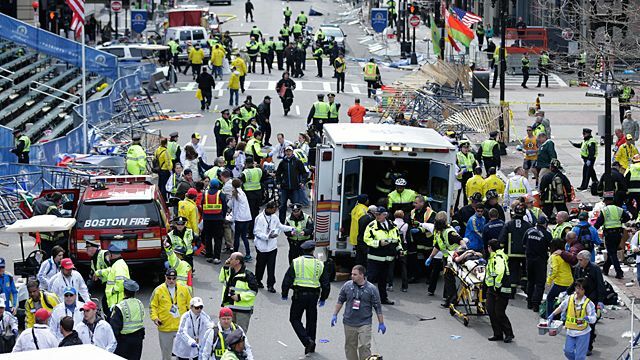 There was no way to garrison the Boston Marathon. Now there will be. Someone will find a way to do it. And I do not know what the race will be now. I literally haven’t the vaguest clue. At around three on Monday afternoon, Back Bay gradually grew grimmer as you walked east toward Copley Square. At Kenmore, it was actually still something of a party. People were streaming up Commonwealth Avenue in the general direction of Boston University and, while there were still a few tearful hugs here and there, most people seem to feel themselves entering something of a zone of safety as they walked by Fenway and off toward BU. Kathy Hynes and Harry Smith, who ran together for almost the entire race, were standing in front of the BU School of Management, wrapped in their silver blankets. They’d made it as far as Kenmore Square. Then, all around them, the iPhones of their fellow runners began to ring furiously, and a police officer told them to execute an immediate right-face and stop. “You could hear people talking about ‘something happening’ at the finish line,” Hynes said. “And then they told us that the race had been canceled because of ‘an incident. '” And that is how the news spreads today, when two bombs go off at the finish line of the Boston Marathon, and at least three people die and north of 100 are injured, some brutally. The shock is sudden but its ripples fade quickly as the knowledge of what happened goes out into the ether and then back through thousands of personal mobile devices. Horror has no shelf life anymore. Everybody knows already. Everybody’s a newsman. Everybody’s in showbiz. The longer you walked down toward the Public Garden, east on Commonwealth, past all the stern iron and stone monuments to great departed Bostonians, the more you saw the faces change. People were staring now, past their friends and their families, off toward some spot in the far distance that only they could see. There were more people crying. There were even more simply wandering, dazed but unhurt, and then you realized these people were traveling through shock after they’d already traumatized their bodies over 26 miles. They were husks, some of them. They had very little left at all. Not far from Public Alley 436, just off Clarendon Street, about three blocks from what some people already were calling ground zero, Joe Nuccio hung out of the window of his apartment, recording video on his iPhone of the slowly untangling crowd on the sidewalk. Joe had heard the first explosion, then he’d heard the second, which he described as more of a blast than a bang. He felt his building shake a little. Then he threw open his window, and he saw people running past. Ultimately, many of the lost and the confused and the separated found themselves and their loved ones at the Boylston Street end of the Public Garden. There was a general milling about and, for a moment, it almost seemed as though the spirit of the day had been recaptured, until you realized that a lot of this joy was about finding out your wife or your son wasn’t maimed, and until you saw the people sitting alone, their backs against the trees, staring up through the branches as if they were hanging prayers on every one of them. The Kings were gathered at one corner of the Garden, next to an old stone fountain. 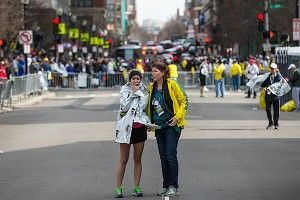 Vicky King had been running the race, and her husband and son had been waiting along Boylston Street not far from the Marathon Sports store, which had been a great place to watch the race until, in a flash of an instant, it had become the worst place to be in the world. “I don’t know if you’ve ever been in a reenactment,” said Ben King, Vicky’s son. “But what the first bomb sounded like was a cannon going off, like, ‘Boom.’ I wasn’t really sure what it was. Then came the second one from up the street, and I saw the police and the EMTs just ripping the barricades away.” Out on the course, Vicky was running with her friend Nancy Breeden from Seattle. They’d just turned onto Boylston Street when they saw the commotion erupt in front of them. “A policeman came up to us,” Breeden said, “and he said, ‘Now, you have to run that way,” and pointed back the way we came, so we did. '” And that was how their Boston Marathon ended. In reverse. And, all around them in the Public Garden, what seemed to be forming itself was something that was not quite a party, but not quite a wake, either. It was something solemn and celebratory all at once, like Easter morning, like a late-coming early spring. By now, they’d cleared out the long white medical tent in the middle of Copley Square across from the Boston Public Library, over whose doors are carved the words “Free to All,” as though that was something permanent about the society we create among ourselves. Earlier that day, the runners who were recovering in that tent from the pain they’d voluntarily inflicted upon themselves were told, in a fashion both chilling and swift, to move to the back, and then the people who had been injured were brought in, and the exhausted, the sunstruck, and the dehydrated moved away, shuffling and stumbling in their bright silver blankets, because the medical tent now had a trauma ward and three people were dead. Now, the tent was quiet and, not far down the street, the fireman sagged on the fender of the truck and stared at the bottle of water at his feet. I do not know what happens now. I know the event will never be the same. It is marked now, and it will be marked in the future, by what happened on the afternoon of April 15, 2013. Some of it will be locked down. Some of it will be tightened up. I walked back down to the Public Garden again, because Copley Square was growing dark and exhausted as the night began to fall. Back by the stone fountain, a woman in a silver blanket told a Providence TV station that she’d been unable to find a ladies’ room after the race because all the restaurants and hotels had been locked down and she had to come all the way down to Park Square to find facilities that would deign to accommodate her. She was not happy at all, and she was telling greater Providence about it. “And I needed TO PEE!,” she told some undoubtedly astounded Rhode Islanders. There was something comfortingly mundane in how truly angry she was. The best example of this came from my friend, Steve Brown, a reporter for WBUR, one of the local Boston NPR stations. Brown swore he heard one person say, “Damn it, this is the first time I ever got DNF’d.” Goddamn runners. I swear, one day, I promise, I’ll laugh about them again. The Marathon will be worth mocking again. But that will not be today. It will not be anytime soon. I sat down near the stone fountain, and wished all of us could wash the day away.